Good espresso preparation is all about the details – details like using scales to control the dose going into our portafilters or details such as programing volumetrics (or using scales on the drip tray) to set the yield being extracted from the coffee, then adjusting the grinder to hit that magic 30 seconds (give or take) which gives us a consistently great espresso. But you can hit all these metrics and still produce an espresso which is disappointingly average. So, what gives? The answer lies quite possibly in how effectively you’re distributing your coffee. It’s surprisingly hard (but crucially important) to ensure that the coffee in the portafilter is evenly distributed. Once you’ve locked in a loaded portafilter and hit that brew switch, a flow of pressurized water will hit the bed of coffee and try to cause trouble. Be aware, this is crunch time – all the preparation of growing, sourcing, roasting and grinding your coffee will either be celebrated or made redundant in this little basket where water meets grinds. An even distribution of grinds within the basket will force the water to behave and deliver you a quality, predictable result. But the trick is to manage that each and every time you brew. A good distribution technique will help you to achieve an even extraction of your coffee and avoid channeling. It will be as repeatable and effective in a busy café environment as in a lab or at your home coffee station. There are two things we’re focusing on here. First, the easy part – getting the coffee into the portafilter. You want to hold the portafilter so that as much of the coffee as possible ends up in the centre of the basket. Depending on which model of grinder you’re using, this is either really easy or a bit of a challenge. Some grinder models tend to dump the coffee off-centre, or if you’re using a dosing canister to weigh doses, it’s pretty easy for the coffee to be distributed unevenly when you tip it into the basket. In the first case, move your portafilter and angle it to achieve the most central distribution during grinding. If you’re using a manual doser grinder, play with the speed that you pull through the dosing lever to help control how and where the coffee is thrown out of the chamber. If the result is a little asymmetrical, don’t sweat it at this point. If you’re using a funnel or dosing cup to dispense grounds into your basket, give the portafilter a swift circular shuffle to neatly spread the coffee around the basket. Once your coffee is in the portafilter, you need to ensure that the grounds are spread evenly around the basket before you tamp. There are certainly a number of different approaches to this issue out there. As espresso preparation has evolved, we’ve adopted and taught a number of different dosing techniques at our Barista Academies. In presenting these techniques, we’ve always felt that they should be easy to learn, easy to repeat and speedy to perform – so you can deliver the results when the docket line is piling up. While you can certainly achieve some good results with a variety of other distribution methods (Stockfleth, straight finger/tool swiping, hand grooming etc.) the following technique is the approach we teach at our Academies, as we’ve found it delivers the most consistent and delicious results, shot to shot. The method is called tap distribution. To tap distribute your coffee, take an empty portafilter and place your ground dose of coffee in the basket using the most effective method for your grinder and work flow. Once you have the dose of coffee in the basket, it’s time to tap. Hold the portafilter in your non-dominant hand and with your dominant hand, tap the basket side of the portafilter five or six times until the bed of coffee has levelled out and is nice and flat. Finally, tap the portafilter lightly on the side of the bench to collapse the dose of coffee, thus removing any large pockets of air within it. The nuance of this distribution method is in how hard you tap, how many times you tap, how you hold the portafilter whilst tapping and finally, how you collapse the dose. First up, when you’re tapping the side of the portafilter you need to hit it hard enough to encourage the ground particles of coffee to move about. If you tap too softly, the ground coffee will only settle downwards into the portafilter, but not outwards, meaning that the coffee essentially remains undistributed. If you tap too hard on the other hand, the coffee will just fly straight out of the portafilter basket! We’re aiming for the middle ground here. At the same time, you want to be nice and consistent with regard to how many times you tap the coffee. As you tap the portafilter, the coffee grinds move around and down. The coffee moves down more if we tap say 15 times compared to 10 times. Ultimately, you want to be consistent. We’ve found that you can consistently distribute your coffee in five to six taps. Next up, you need to move the portafilter around as you are tapping it. If you hold the portafilter perfectly flat and tap it, the ground coffee will just bounce in one direction making the distribution even worse. To compensate for this, as you are tapping the portafilter, hold it on an angle so that the highest point of the basket is where you are tapping and the lowest point is the opposite side of the basket. Essentially, if you hold the basket on an angle, the ground coffee will be moved to the lowest side of the basket as you tap. Once the coffee is evenly distributed, it’s time to collapse it by tapping it downwards onto the bench. When doing this, ensure that the basket of the portafilter is perfectly flat and you are moving with a straight downwards motion. On many portafilters, the angle of the basket is different to the angle of the handle, so a barista who is holding the handle of their portafilter flat is actually holding the basket on an angle. Therefore when they tap down, they are not creating a perfect downwards force on the coffee. Keep this in mind and ensure your basket is perfectly flat and moving straight down for your collapse. Your collapse doesn’t need to be a super hard smack on the bench. Just firm enough to move that coffee down. 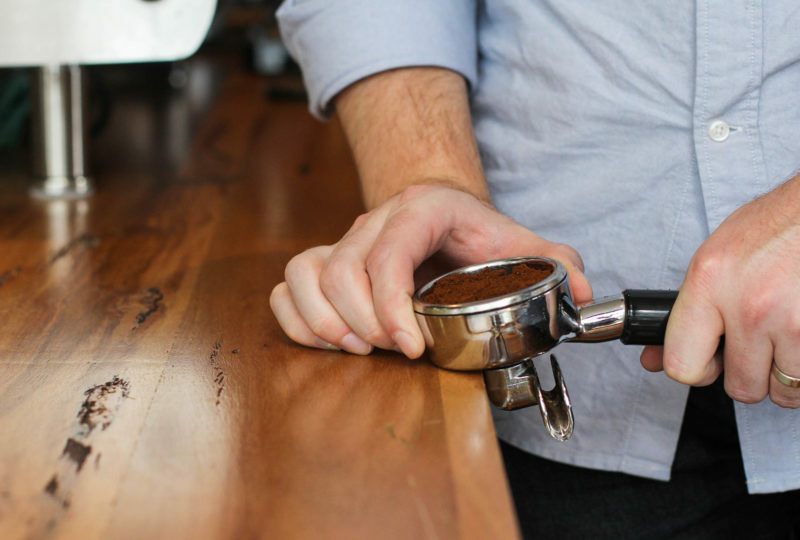 Once you’ve distributed your coffee, it’s time to tamp it. Once again, there’s a real emphasis on flatness here. Ensure the tamper enters the basket of the portafilter as level as possible and moves straight downwards. You don’t want to enter on an angle and correct it later because you’ve already changed the distribution of the coffee by that point. At this point, a lot of people will ask how hard they need to tamp. Historically, baristas have put a lot of emphasis on how hard you need to tamp, even going to such lengths as practicing the pressure of their tamping on a set of bathroom scales. Some baristas will tell you that 15kg of pressure is necessary, others will say 25kg or even 10kg. In reality, it doesn’t actually matter that much. You can only compress a solid so far (unless you’re a hydraulic press) so it’s quite easy to tamp hard enough. Just push down until you feel the coffee pushing back against you. Once you’ve done all this, how do you know if you’ve improved your coffee making or not? Well, it’s time to do some taste testing! If you control all your other variables and only change your distribution technique, you can taste several espressos and compare results. Make several espressos, one where you do not distribute and one where you employ our tap distribution method, and then add any other distribution methods you’re interested in testing. When your shots are pulling in a time that you know should taste good, start tasting the different espressos. We’re looking for the shot with the most balance, due to the water extracting as much even deliciousness from the coffee as possible. Better prepared espressos will taste sweeter, richer and less sour – and they will have a pleasing balance between acidity and bitterness. Tap distribution hits all these marks. Give it a try!